December 25 th. is the event that each year, since 2000 years, is repeating itself. But does it repeat in the hearts of men, or in the tradition of a cold and passive tradition? Men have called CHRISTMAS to this great event and have marked it with this date. In the whole world there are festive air, frantic race for buying for the traditional expensive, wanted,"gift exchange", while the tables prepared will appear in the center of the thoughts of all ... Christmas ... feast of donations, feast of copious lunches and dinners … and HE, the Master of Masters, JESUS, as each year, has made that men hear his voice in crying and distress through EUGENIO, who knew how to hear him. "THIS IS THE TIME IN WHICH YOU REMEMBER ME, MY ARRIVAL IN YOUR WORLD. THERE WILL COME A TIME IN WHICH YOU WILL FORGET ME, MY BIRTH, MY PAIN, MY DIVINE PASSION AND THE WHOLE HEAVENLY TRUTH. YOU REMIND ME FOR A FEW HOURS AND THEN YOU WILL FORGET ME FOR THE REST OF THE TIME, UNTIL YOU REACH ANOTHER CHRISTMAS. I REALLY ASK YOU: ARE YOU SURE, SONS OF THIS WORLD, THAT THE NEXT CHRISTMAS YOU WILL BE ABLE TO REMEMBER ME YET, EVEN DURING THE SAME FEW HOURS, AS WELL AS YOU REMIND ME IN THIS? IN A TIME, TO BRING YOU LOVE, BECAUSE YOU HAVE CRUCIFIED LOVE, BUT I WILL COME TO BRING YOU A NEW LIGHT: JUSTICE. YOU FOOLS! HOW FOOLISH YOU ARE! YOU MAKE ME SO MUCH FESTIVE CELEBRATION AND YOU TRASH ABOUT AS MALLARDS IN THE BLOOD OF YOUR BROTHERS! YOU REMEMBER ME WHILE YOUR THOUGHTS AND ACTIONS FLUCTUATE IN THE ROT OF YOUR CRIMINAL WORKS! YOU ADORE ME WITH THE HANDS TOGETHER AND YOU DIRTY WITH FILTHSAND WITH A LOVE THAT LASTS AS LONG AS THE LIFE OF A SIGH! 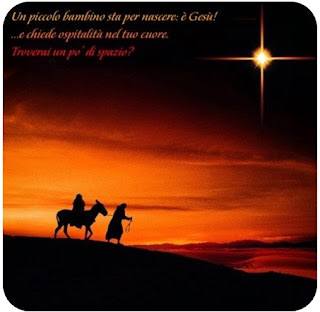 WHILE YOU DECORATE WITH FESTOON YOUR HOUSES AND YOUR STREETS, THE HEAVEN OF YOUR WORLD IS ADORNED BY SIGNS THAT PREANNOUNCE YOU A NEW "CHRISTMAS", A NEW AND MIRACULOUS EVENT THAT NOBODY OF YOU EXPECT: MY RETURN. THE WORK; SO THAT THE HEAVENS TEAR ON THE DAY AND AT THE TIME THAT ONLY THE FATHER KNOWS. IN THIS DAY AND IN THAT TIME, TRULY, I SAY: IT WILL COME THE TRUE CHRISTMAS, THE FEAST AWAITED FOR TWO MILLENNIA, THE TRIAL OF A GENERATION, YOUR GENERATION! In a recent visit that took place on 12 18 2011, a prisoner of the prison of Rebibbia Rome requests to Benedict XVI: "My names is gianni Department G8. I wonder: why was the absolution delegated to the priests??? ¡ ¡ ¡" If I request on my knees, alone, within a room, talking to the Lord, shall I´ll be relieved?!!! " "Or, when you pray, don't do as the hypocrites, who like to be praying in the synagogues and on the corners of the streets, to be seen by men. In truth I say unto you: they already have their reward". (MATTHEW 6.1 -5) "But you, when you wish to pray, come to your room and, once closed, pray to your father in secret and your father, who sees in secret, will give you the reward". The rest you read it with lumen of truth, so that you can understand the true meaning, so that you can understand and be free from the slavery of lie that nourishes those who do not understand the word of God. Be aware of them, who are not doing anything but interpreting in another way the word of God and this, in order to fill the synagogues and fill the space with so many words to become complacent. You, pray much to the Lord, pray as well as the Master has taught you, knowing that you are one with your father who is in heaven. He, who seeth in secret, shall ensure according to the justice that you deserve or not, to be heard or not. PRAYER WILL BE ORLY HEARD WHEN, THIS WILL BE FOLLOWED BY WORK. DO NOT SPEAK ONLY WORDS, BUT DO IT ACCORDING TO THE LAWS THAT YOU HAVE INHERITED FROM THE GENIUS SOLAR "CHRIST" JESUS. JESUS PRAYEDAND WORKED: IMITATE HIM. THE WORDS DO NOT HAVE ANY MEANING IF IT IS NOT BUILT, IF YOU DO NOT BUILD NOTHING INSIDE AND OUTSIDE OF YOU. YOU TERRESTRIALS PRAY BUT THERE YOU STOP. THEY ARE BETTER THOSE WHO PRAY LITTLE AND GIVE SO MUCH, SEEKING TO IMITATE TO WHOM LOVED TEACHING TO LOVE ONE WITH ANOTHER AS BROTHERS AND TO MUTUALLY HELP EACH OTHER. YOU TERRESTRIALS, PRAY AND AFTER YOU HAVE PRAYED YOU ARE, AS BEFORE, OR WORSE THAN BEFORE: ISOLATED, CLOSED, INSENSITIVE, APATHETIC, INTERESTED ONLY IN YOURSELVES AND IN YOUR ASSETS. THE SKY DOES NOT LISTEN TO THESE PRAYERS, THE SKY WILL BE HONORED ON ACCOUNT OF THE WORKS MORE THAN WORDS. WORKS WHICH BUILDS UPON THE GOOD AND RELIEVE THE SUFFERING OF THE NEXT. WORKS THAT UNITE RATHER THAN DIVIDE. WORKS THAT GOD LOVES. "I HAVE SAID AND I REPEAT! " “THE TEMPLE OF MY FATHER, IS NOT MADE OF STONE". “THE TEMPLE OF THE FATHER IS IN YOUR HEART" AND THE VIRTUES OF THE SPIRIT ARE IT SUPPORT, THE WISDOM OF THE MIND, THE SENSIBLE INTELLIGENCE DEVOTED TO THE GOOD OF ALL LIVING BEINGS IN THE WORLD. WHAT I SAID BEFORE AND I REPEAT NOW! "RENDER TO CÉSAR WHAT IS OF THE CÉSAR AND TO GOD WHAT IS GOD'S '. IF YOU DENY TO GOD WHAT BELONGS TO HIM, HE WILL DENY HIS BLESSINGS AND, INEVITABLY, YOU WILL REMAIN DEFENSELESS BY SCREENINGS OF THE EVIL AND BECAUSE OF THE HEAVY BURDEN OF CORRUPTION AND THE UNCLEANNESS. "MY FATHER HAD RESERVED HIS DAY" AND I ASSURED YOU THAT, HIS HOLY WRATH WILL COME AND THAT EACH THING ROTTEN WILL BE SOLELY ELIMINATED FROM THE EARTH WITH A FAIR AND STRICT TRIAL. OTHER THINGS I HAVE SAID AND I HAVE REPEATED SO THAT YOU CAN REPENT ON TIME.